What an invigorating day! Yesterday I attended a Diva’s Who Dine (DWD) lunch held at Jour et Nuit Restaurant. For those who don’t know, DWD is an organization for female entrepreneurs and business executives primarily in the fashion/media/design world to mingle and network.. This was a particularly special gathering as the founder Zoe Alexander was in town to attend. Other divas included designer Kathlin Argiro (her dresses are always on Stacey London and featured on Fashionably Late with Stacy London), TopButton.com founder Dianna Feldman, event planner Maya Kalman, Bulter Bg founder Jen Groover, pr diva Monica Schenker and many more. I just can’t tell you how alive I feel after these lunching and gatherings (this being my second time). When your in a room with women who have launched successful fashion brands, websites, pr firms, marketing campaigns, TV shows, etc. it makes you feel like you can do it too. Of course, the networking is amazing. I can’t wait to connect with several of the pr gals to get more info about their clients, to chat with some of the style experts for upcoming shows and In HER Bag features and of course to connect with journalist and producers to help me expand on the bag guru brand. Wow. Did I already say how invigorating the day was? Diva’s Who Dine is as healing, energizing and therapeutically as a good day at the spa! Forget about my monthly trips to Bliss, I’m going to apply to be a full-fledged Diva member. Membership is $400 a year for the New York chapter, and I just know it will be worth it. If you’re reading this and you’re an entrepreneur or in the process of changing your career path I recommend at least checking out their website. I'm completely addicted to the UltraHD channel. The runway reviews, beauty tips, designer Q&A ... I can't get enough so I usually have it in the background while I'm working. Just now I tuned in a bit closer to see Judy Licht interview Michael Kors. Here's what the designer and Project Runway judge had to saw about our favorite accessory. If you happen to be watching CSI Miami recently, you may have noticed a cameo appearance by The Elliott Lucca Signature Woven Drawstring. I have to say that this brands woven collection is really nice and quite affordable. This bag retails for $398, and we're not talking about getting embossed weave. This is the real deal, just like - well, not just like, but pretty similar to - the fabulous Bottega Veneta weave. You have the hand crafted feel and certainly the attention to detail. The hardware is really nice. I just got one of their woven bags from the spring 2008 collection - another lovely perk courtesy of the job! :) Anywho, it's a great, woven leather white tote with thick strip of muted woven gold (not offensive, gaudy gold) going down the center and smaller silver woven strips on the side of the gold. This gives it a sporty look, but because of the structured shape and the lux effect of the woven leather, the overall vibe you get from this bag is classy summer ease. The best part is that there is an inner slip compartment for my laptop - always a plus. 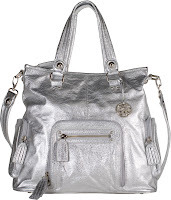 So, between this, the new Rebecca Minkoff Steady ($599) I've pre-ordered (you too can pre-order from SHOPBagTrends.com. For ship dates and colors e-mail customerservice@bagtrends.com or you can call 718.531.6793 M-F 9am-7pm EST), and my red Lulu Guinness tote (I still very much love it though I may temporarily retire it after this summer, just to keep things fresh) I should be all good to go. Wow. That was a vicious run on sentence. Sorry about that :). Last Friday was quite eventful. I had lunch with June Change, the designer behind CHia handbags. The Spring/Summer collection is fabulous. You just won't believe the bags you'll get and the prices. There are a few styles at the $350 range that are really special and destined to remain in your immediate handbag repertoire for many, many years to come. Of course, the Asianna tote (which is a big hit at SHOPBagTrends.com) is coming in new colors including this really amazing grey that you'll flip for. It's a year-around color which can be made super summery if you wrap a bright scarf around the handle! I'll be able to share images of the new collection in about a week, so stay tuned. Before our lunch, I went to preview Vegan Queen a new eco collection. I first heard about the brand about 2 months ago when Evelina, the designer e-mailed me. From the images I already saw something worth a closer eye. When I finally laid my eyes on the bags this past Friday I have to tell you this is the first environmentally friendly brand that I would actually L-O-V-E to wear. Her VQ logo is very elaborate, adding to the lux look. The piping, structure and construction is impeccable. This isn't your mother's eco, home-made bag! The inside is lined in like a soft eco-cotton fabric that is reminiscent of the suede lining you'll find in really expensive high-end brands. All in all, I can't wait to see future Vegan Queen bags. In fact, I liked this collection so much, I'll be offering it to all you bagistas at SHOPBagTrends.com. It should be available in about a week or so. What a long day. I actually have bag overload. I spent all day reviewing work bags for a story I'm doing called "New Year, New You, New Work Bag." It's for a MAJOR ( let's image Victoria Beckham said "major"), yes major media outlet. I'll reveal it next week once all paperwork is done. I'm very excited about this addition to my career. So I've been reviewing bags from Payless to Prada and my eyes are killing me. Many of these bags I've seen in person and some I'll still have to call in. But I just like seeing how all the images look next to one another as I narrow down my list. I can do this process for hours because I want to make sure I give readers options. Like with me, I don't care if a satchel comes with a detachable shoulder strap, but as I mentioned earlier today I'm not the mom with the files and the kids and the groceries in her arms. After a day of bags there really is no better way to unwind then ... drool over a new bag. I know, i know. I'm hopeless. Right now, I'm drooling over the Hermes Vintage Crocodile Piano Handbag available at Bag Borrow or Steal . It's so me. Petite, refined, classic . Oh what I wouldn't give to have it right now? The brown crocodile color is perfection and the inner compartments perfect for the necessities of modern life on-the-go. Naturally, this isn't an everyday option - at least not for most working girls. But, on a casual day when I have few appointments and not much to carry ... oh to dream. Well, at least I can borrow it for fashion week. Don't be surprised if I'm raving about this stunner in 2 weeks. Um I wonder what I will wear this with? Oh and how fabulous will it be to faux own this bag? If I go completely mad or fall in love I may need to take advantage of the "steal" option of Bag Borrow or Steal .